Fan is a movie about passion, devotion and obsession. It is a story of all those starstruck fans for whom their idol is the reason to their life. Coincidentally and (un)fortunately, there isn't a dearth of fans like that in India who are always ready to go overboard to fulfill their craziness. You, me and our society is no one to judge them and label them as stupid, psycho or crazy because it is difficult to understand their perspective unless you are a Fan. As Gaurav says in the film, "Rehne de tu nahi samjhega"
ii) He bites his lip and shows with action, "De de ke maara.. De de ke maara"
Other actors hardy have any screen time. Of course, when you have 2 SRKs in the film then other actors shouldn't have much hope of any footage. Waluscha de Sousa plays Aryan's wife and does justice to her role as a beautiful mannequin. Yogendra Tiku and Deepika Amin as Gurav's parents makes you empathize with them. Especially the scene where they are supporting Gaurav as backstage artists. Shriya Pilgaonkar (daughter of talented Sachin and Supriya Pilgaonkar) reminds you of cute and bubbly Priety Zinta / Genelia D'souza. Theme of the film is quite fresh - "A crazy fan and his quest to meet his idol". But somehow script writer Habib Faisal couldn't build on the story further and story fizzles out by interval. What follows is a typical Bollywood Masala movie of "Catch me if you can". It is a hackneyed plot which is not only shown in Hollywood (The Fan, 1996) but also in SRK's own film Duplicate (1998). I am glad that the film doesn't have any songs (not even the Jabra Fan) and manages to get over under 150 min. But the chase sequence promoting tourism in Dubrovnik (Croatia) and Indra Vihar, Delhi were a bit drag. There are limitless glitches in script which are hard to ignore. Superstar running amok after a common man, jumping from building, bleeding everywhere. Why does he has a security team and army of bodyguards? Gaurav wasn't a bright student in his class and runs a cybercafe. Suddenly post interval he becomes crime master Gogo, manages to get Aryan's phone number, gets access to his itinerary, manages to get fake id, WOW! May be Director forgot to show that Gaurav did a brief stint in Al-Qaeda where he was taught to become James Bond. Even the end of film was negative and reaffirms the fact that a fan's only identity is his idol. He is nothing without him. C'mon, is that the message SRK wants to give to another 100 psychotic fans of his who are ready to go any extreme with a drop of hat. 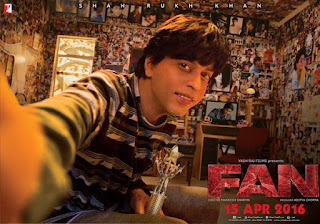 Verdict: This film is an out and out masala flick made for the numerous fans of SRK. If you are a fan (of SRK or any other celebrity) then it'll strike a chord with you. Else, you won't be able to relate with all the craziness going around. However in absence of any good films in theater now, you can go and watch it. You won't be pleased but not a bad idea to beat scorching heat in AC and comfortable sofas. 1. Is this obsession of putting stars on pedestal good for our society? What impression does it create on young minds. Why this adulation is reserved only for Films and Cricket (not any other sport)? Unfortunately, it is nothing less than a contagious disease. These mere mortals then gets elected as our MLAs/MPs and enjoy further stardom. 2. For any Superstar, it must be a routine to face psychotic fans like Gaurav. Does that disturb them or they enjoy this stardom? Of course they can't share their time with every fan but how do they appease everyone so that other Gauravs aren't born? 3. Parent of Gaurav were throughout supporting his madness for Aryan. Isn't that what is happening courtesy various reality shows in India? Parents are lobbying for their kids, buying votes so that their kids can win. Kids are dancing on item numbers in an age when they should be singing nursery rhymes. Kids get heart broken and cry copiously when they get eliminated from a show. Camera loves those scenes, doesn't it? Should winning a reality show be a dream for these kids or they should get inspired to do something meaningful? 4. SRK says a very good line towards the end of film. "I am also a normal person like you. I came from an average background, had lots of dreams and had to face lots of challenges. I struggled hard and finally became what I am today. Still, I have my own problems my own challenges even now that I have to deal with. Why do you idolize me? Why do you want to become Junior Aryan Khanna when you can become a great Gaurav Chandna. I hope all these fans remember these lines and make their own mark in society. Adios!